Purim is known as an exhilarating and joyous celebration that erupts in festivities after the salvation of the Jewish people from their near demise. 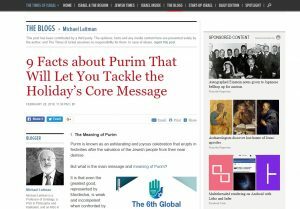 But what is the main message and meaning of Purim? It is that even the greatest good, represented by Mordechai, is weak and incompetent when confronted by the greatest evil, represented by Haman, and that evil can only be overcome by unification. Mordechai’s appeals for King Ahasuerus’ mercy on the Jews to Queen Esther lead to her famous statement that she cannot help them if they are dispersed and disunited. Then, Mordechai goes on a mission to pass on this call for unity to the Jewish people, and when they eventually unite, Esther gets Ahasuerus to take mercy on them. The costumes that people customarily wear to Purim parties signify the concealment of the forces that enact the Purim story within us. Queen Esther signifies a desire that has been corrected to connect with God. That is the reason why she emerges after King Ahasuerus divorces Queen Vashti for corrupting her ways. Her name, which is “Ester” in Hebrew, stems from the Hebrew word for concealment, “Hastara,” since her identity as a Jew is hidden. The identification of Esther as a Jew remains hidden until she needs to make moves to redeem the Jews from their threat of destruction. Thus, “Megillah,” the Hebrew word for “scroll” or “book,” as in “The Book of Esther” (“Megillat Ester”), comes from “Gilui,” i.e. the Hebrew word for “revelation.” The story in the Book of Esther is thus thought of as a concealed miracle, to signify the miracle of the revelation of God’s power acting via concealment. Mordechai signifies the attribute of mercy: selflessness, compassion, generosity, altruism and plain goodness. This is notably expressed in a key moment of the Purim story, when Mordechai warns King Ahasuerus, through Esther, about a plot to assassinate the king. Mordechai neither gains nor requests any compensation nor honor for his efforts. Since Mordechai is purely benevolent, he has no will to rule or control. Although the people would be better off and happier under Mordechai, he doesn’t have the same drive as the power-hungry, evil Haman. In order to motivate Mordechai to make moves to become ruler, King Ahasuerus needs to institute a great threat not just to Mordechai, but to his people, the Jews. That’s where Haman comes in. Haman signifies the complete opposite of mercy: an unrelenting will to rule, control and satisfy his own selfish desires, completely inconsiderate of others. Haman raised the claim to King Ahasuerus that the Jews should be killed because they were not keeping his laws, i.e. they were disunited. “There is a certain people, scattered and dispersed.” This was an accurate claim because the laws by which the Jews became a nation at the foot of Mount Sinai were laws of unity. Therefore, being “scattered and dispersed” means that they failed to uphold the laws that made them a nation to begin with. While separated, the Jews were deemed unnecessary, which is why Haman has a case in his efforts to eradicate them. The Jews, on one hand, feared for their life. On the other hand, they couldn’t understand what they did to deserve such a harsh verdict. Mordechai then gathered the Jews, reuniting them, and voiding Haman’s claim void that they were scattered and dispersed. Thus, by uniting, they no longer breached the king’s law, and the verdict against them was reversed. As with all the Torah’s stories, the figures and the interplay between them represent attributes and powers playing out in our thoughts, desires, attitudes and relationships. They are just as present today as they were thousands of years ago. Moreover, the more we develop, the more these powers intensify. The ruthless will to rule and control surfaces in some people more than others, to the point of entirely consuming some, making them do anything possible to rise to all kinds of positions of power. Therefore, the core message of the Purim story is that our unity is our salvation, and our neglect for our unity endangers, harms and can even potentially annihilate us. After our salvation through our unity, the joy erupts, and it is a commandment to drink until we cannot tell right from wrong. This is because our unity spreads unity, until every person and nation willfully makes the right “click” to each other. By this, we become a “light unto nations,” a beacon of the light of unification for the whole of humanity. By uniting, we would not need to watch our backs all the time like we do now. Also, we would not distrust or suspect any one of any devious or underhanded intentions, since we would be as a single person. Intoxication signifies the blurring of lines between Haman and Mordechai, since when united, the tension between these tendencies becomes released in euphoric joy. Haman’s pockets signify the correction of Haman’s self-aimed desires to control and rule when all people unite. Their sweet insides symbolize the joy of uniting in selfless desires. It is also why we give gifts to each other and to the poor—to express our upgraded bond. Purim is more than a festive holiday. It is a lesson in what is most important in life, that we should always concentrate on how we can improve our connection to each other, to unite above our differences, and that if we don’t do so, there are plenty of evil Hamans ready to take advantage of our disunity, waiting for the opportunity to build themselves on our downfall. Using this lesson, we can set up reminders so that we never forget our need to unite, and rise to the challenge to progress from strength to strength in an ever-increasing unification above all the forces that surface to distract us from that. I wish everyone a happy and united Purim!